Incredible autumn colour makes Parrotia persica a favourite with our staff! 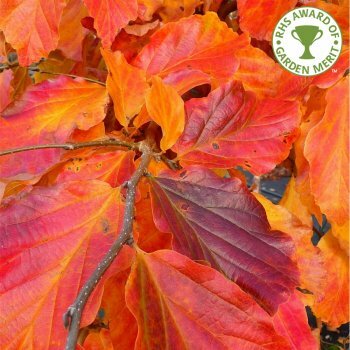 Large glossy, deeply ribbed mid-green foliage turn vibrant shade of yellow, orange, red and purple in autumn for a magnificent kaleidoscopic display. Holding its leaves for a long time, the autumn display is often extended for several weeks. This stunning show is followed by clusters of witch hazel-like ruby-red flowers on bare branches from February-March that will still look fresh after a heavy coating of snow. The flowers are actually petal-less and what you see is the red stamens. The bark is silvery grey and as the tree reaches maturity it flakes, revealing shades of pink, green and yellow young bark. This beautiful short trunked, spreading tree will grow to 6 x 4 metres in 20 years and has almost horizontal branches. Parrotia persica is an absolutely spectacular specimen tree named after the German naturalist Friedrich Parrot. Commonly called the Persian Ironwood, this tree originates from Iran and belongs to the genus Hamamelidaceeae, related to Hamamelis (Witch Hazel). Tolerant of almost any conditions apart from drought, this tough tree will cope with sun or light shade, acid or alkaline soil and exposed or sheltered positions. Persian Ironwood will do best in a moist well drained soil, approaching damp conditions. Soil: Suited to most soil types (acidic gives the finest autumn colours) and moist but well-drained situations. Pot grown Persian Ironwood trees can be planted at any time of year. Whilst hardy, choosing a sheltered position will protect the spring flowers from frost. Remove all weeds and grass within a metre of the chosen planting hole. Dig a square hole as deep as your root mass and approximately 2x as wide. To help it establish more effectively, we advise applying Mycorrhizal Fungi root grow into the hole. Remove the pot, gently loosen the roots and place into the planting hole. If your soil is poor, mix 50% of the original soil with 50% compost, fill in the hole and firm around gently. Avoid banking the soil up around the collar of the tree . We recommend planting Persian Ironwood with a stake and tie (unless it's a multi stem). The tree planting guide has more detailed information, as well as videos. If you’re planting Persian Ironwood in spring or summer, water well and regularly for the first few months. Increase watering if there are extended periods of hot or dry weather. If planting in autumn, you may only need to water a little. Persian Ironwood trees do not require regular pruning. If you wish to tidy up your Persian Ironwood, do this during the dormant season. Focus on removing any damaged, diseased or overcrowded branches. If you require a clear trunk, remove any side shoots to help raise the crown.